Last year, Apple introduced its cheapest iPad (non-Mini, at least) – the £339 iPad 5th generation. It came with no bells, and absolutely no whistles – its case even copied 2013’s iPad Air, rather than the thinner, slicker look of the iPad Pro 10.5-inch or iPad Pro 12.9-inch. But it didn’t matter, because it was a great price, was reliable, had a nice Retina screen, and was as fast as you needed. For a shared family tablet, full of games and apps that make proper use of the tablet’s bigger screen, it was ideal. A year later, that iPad is still more than good enough for that job, so we didn’t think we’d get an update for it this soon, but here we are, with the iPad 9.7 (as Apple now refers to it). So what new features has Tim Cook bestowed upon us? •Discover the best iPad deals this month! Well, barely anything, actually – there’s now support for Apple’s Pencil stylus, and the processor has been boosted from an A9 chip (as seen in the iPhone 6S), to the A10 (as seen in the iPhone 7). And that’s it, except Apple also sliced £20 off the price, so it now starts at a tidy £319 for a 32GB model. It means that, if you already have last year’s model and are wondering whether to upgrade, the answer is: not really. But if you’ve got an older iPad or are looking for your first one, let’s go into what you get here. The iPad 9.7 screen is bright and clear, and there's just about enough space for some light multitasking. Maybe the single most important part of a tablet is its screen, and though the iPad 9.7’s 2048x1536 display is far from cutting edge, it’s really good. It’s definitely the biggest area of difference from the iPad Pro, especially now there’s support for Apple Pencil. You don’t get the wide colour display of the Pro models, which is a bit of a shame if you have an iPhone 7 or later to take compatible wide-colour photos, but definitely isn’t the end of the world, since it’s still bright and colourful. You don’t get HDR support either, supported on the Pros and the Samsung Galaxy Tab S3. Again, we prefer to have it for watching movies, but it doesn’t have as much impact on small screens as on a TV, so it feels like a reasonable trade for the price. The pixels don’t feel as close to the surface as the iPad Pro’s either, but again, this is the difference between mid-range and premium. That’s the gist – even aside from size, the Pro’s screen is that much more luxe across the board in ways that justify the extra price, but this is definitely good enough. That said, there is one missing feature of the screen we’re frustrated about: that it’s not TrueTone. This is Apple’s name for tech that adjusts the colour temperature to match the ambient lighting of the room, so that white on the screen looks like a sheet of paper would in the same light. TrueTone screens are so much more pleasant to use, especially if you’re using the tablet before bed, and if you’ve ever tried it for a time, going to a device that doesn’t have it feels like a big step backwards. With this tablet being aimed more at families (and especially kids), we feel that a feature that saves their eyes, especially in the evenings before bed, would be a really valuable addition. The Apple Pencil is not included in the price but support works well for it. When you’re writing notes, the stylus feels responsive, accurate and slick. Once again, the iPad Pros have it slightly beat, though. 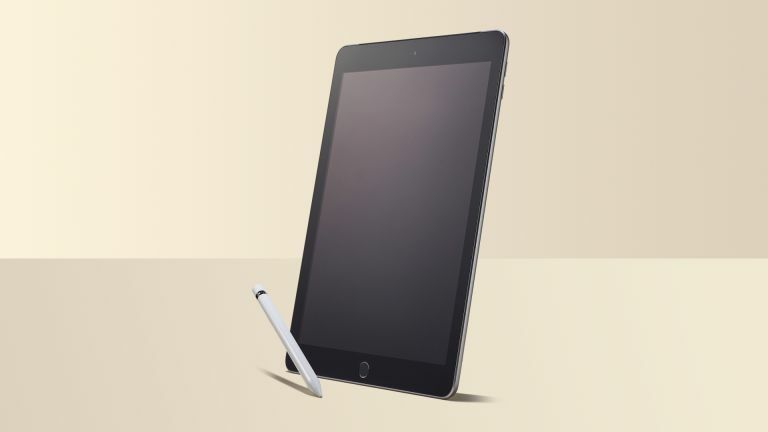 The Pros’ screens refresh 120 times per second, while the iPad 9.7 refreshes 60 times per second, so if you’re sketching or drawing in fast movements, you’ll see a tiny bit of lag on the lines appearing on this tablet, whereas they look essentially instantaneous on the Pros. It will only be annoying if you’re planning to do a lot of high-level art, but if that’s your bag, you should definitely grab one of the two bigger models anyway. Performance and responsiveness everywhere else is great. The A10 chip isn’t quite as powerful as the A10X in the iPad Pros, but just using the iPad 9.7 for our usual web browsing, working in documents, gaming, and playing with GarageBand and iMovie, we didn’t have any speed problems. The multitasking in iOS is well supported, so you can have apps side by by side, or have one floating for a quick task, without any slow-down. The size of the screen means its not exactly a dual-app productivity powerhouse (the seemingly small change to the 10.5-inch screen on that iPad Pro actually makes a big difference for what you can see in both apps, and the 12.9-inch model is obviously on another level). Even so, we had no problems using it for tasks such as looking something up in Safari on one side and writing into a document on the other. Battery life is solid, thanks to a big capacity and a phone-level processor. Apple claims 10 hours, as it usually does for iPads, but with the screen lower than full brightness and in light use, that’s fairly conservative. Conversely, a non-stop bout of Civilization VI will mean a lot less than 10 hours. You only lose a couple of percent per day on standby, so there’s rarely the frustration of finding it dead when you want to watch YouTube. Speaking of which, while it’s fine overall for video, the speakers are a bit weedy – you don’t get a nice stereo set, as on the more expensive iPads and even the cheap Kindle Fire HD 8. The speakers are clear enough, but there’s a disappointing lack of oomph. The front and rear cameras are unchanged from the last model, which means they’re… fine. They work well enough for a bit of FaceTime, picking things up nice and clearly for the augmented reality apps that Apple’s pushing right now, and the image quality is decent. They’re nowhere near as good as what’s in phones, and the lack of a flash could be a pain sometimes, but they do the job. The 32GB of storage in the £319 model is also solid. If it’s just going to be a video/browsing machine with a few games, it should be plenty. If you are likely to fill it with photos and your own videos, you can get a 128GB model for £409, which is a reasonable upgrade price. There’s no microSD card slot for adding your own storage, of course – that just ain’t Apple. For its price, we think the iPad 9.7 is an excellent buy. It’s the VW Golf of tablets: you can go cheaper and get something that works great, but miss out on the level of quality, reliability and finish; you can get something flashier and more powerful, but for a lot more money. Adding an Apple Pencil for note-taking does increase the price significantly (it costs £89), but even then it’s still about £100 cheaper than the Samsung Galaxy Tab S3, which is the same size, and comes with a stylus. The Tab S3 has an HDR display and strong quad speakers, but we’d still take the iPad at that price difference. Adding a TrueTone screen and stereo speakers would make it more of a killer product but as it is, Apple still makes the mid-range tablet to beat. It’s sure to continue to dominate its market, even if owners of iPads from the last few years have little reason to upgrade. Why buy anything else?